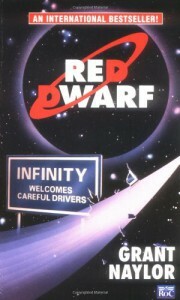 Infinity Welcomes Careful Drivers by Rob Grant and Doug Naylor is a novel based on the British sci-fi comedy show Red Dwarf. Dave Lister, a lowly technician on the mining spaceship Red Dwarf, gets put into stasis as a punishment for smuggling a cat on board. When he emerges from stasis he finds that a nuclear accident wiped out the rest of the crew and it is now three million years in the future. The only other survivors are a feline-humanoid life form that evolved from his cat, and his bunk mate who died but was revived as a hologram. Tensions are high as they do their best to survive and navigate the various obstacles they must face as they try to make their way back to earth. This was a quick but fun read. The ending wasn't exactly a cliffhanger, but it did make me want to read the next book right away. I'd definitely recommend this book to anyone who enjoyed The Hitchhiker's Guide to the Galaxy or anyone that just enjoys British humor. Though I did enjoy the book a lot, I thought the show was funnier. I think this is mostly due to the fact that sometimes humor translates better in an audio-visual format than the written word and for this reason I also found The Hitchhiker's Guide to the Galaxy radio plays to be funnier than the books. I don't think it's necessary to watch the show before you read the books, but it's more fun that way because it's easier to imagine the character's voices and what they look like. The book does give some background story to the show, but it's different in a lot of ways. Some events happen in a different order than they do in the show and many plot details are different. If you do decide to watch the show before reading the book, I'd recommend watching the entire series before starting the book. I started reading the book after I'd only watched most of the second season and then started going back and forth between the show and the book. I started to find this rather confusing due to the differences between the show and the book and it became harder to keep the storylines of each one straight in my mind. I'm hooked now though and I definitely couldn't wait to finish watching the entire series before starting the next book.